The Water Safety Plan is a new systematic approach of evaluation and risk management in the drinking water sector and it is applied to every potable water system to guarantee regular supply of tap water which is suitable for human consumption; it focuses on human health protection and can be integrated with other water quality or supply performance requirements. Acque Bresciane S.r.l. 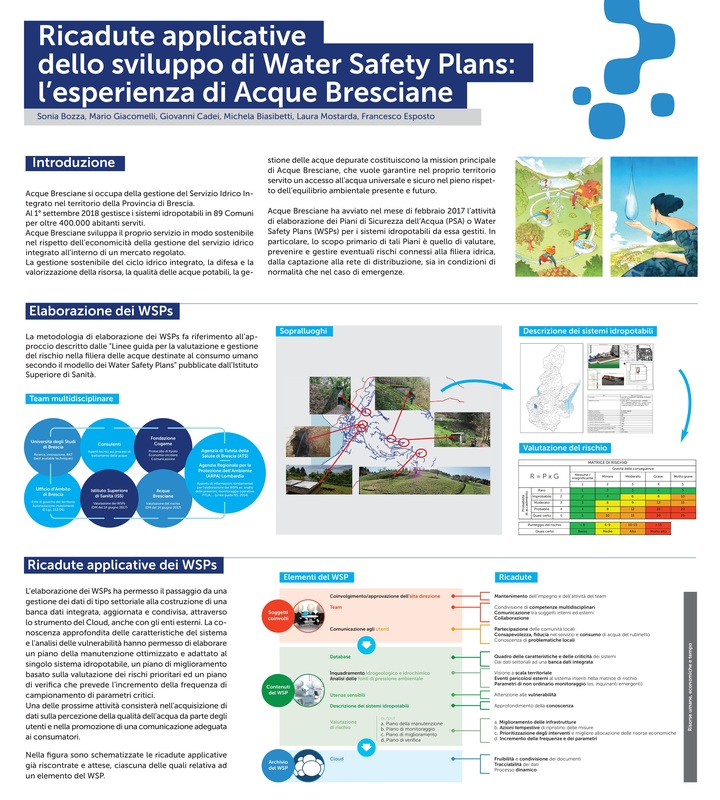 manages the potable water systems in 92 municipalities in the Province of Brescia and in February 2017 it started the elaboration of Water Safety Plans (WSPs) with the aim of guaranteeing regular supply of quality drinking water to its customers. The development of WSPs highlighted various innovative aspects and benefits for the provider, for the customers and for the various members of the WSP team who operate in the territory (auditing bodies, environmental protection bodies and research bodies). In particular, we have moved from segmental data managing to the setting up of an integrated and updated database. This has resulted in a new organisational arrangement: from a retrospective approach, based on surveillance and emergency intervention, to a preventive one, based on risk evaluation. Moreover, we mean to guarantee more information to our customers by promoting appropriate communication (informative events, website, etc.) and gather data on customers’ perception of the quality of water. We have adopted an innovative schematic document where data is organised in easy-to-read tables and charts so as to make the WSP a practical tool, shared among the WSP Team members on the Cloud, a virtual space which guarantees data transparency and control.